We at Super specialize in manufacturing of glass distillation units which are especially tailor made as per clients requirements. 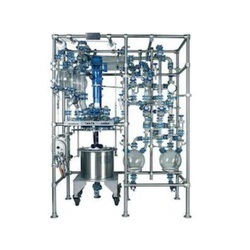 We offer simple distillation units, fractional distillation units, reaction distillation units etc on pilot scale as well as industrial production scale. Each and every part of these units is entirely inhouse made to maintain Super 's high quality standards. We also have qualified technicians for installations of these distillation units at clients premises. 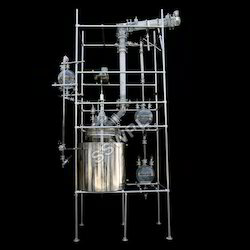 All these distillation units are available in both GMP and Non GMP models with flame proof and non flame proof versions. Capacity 10 Ltr. / 20 Ltr. / 50 Ltr. / 100 Ltr. / 200 Ltr. Glass lined Reactor is mounted by the Vapor nozzle. 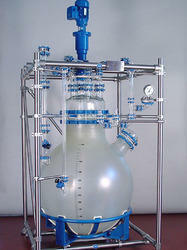 Glass Distillation Assembly is used for the distillation process of gases. They have two divider and receiver system facility to working under vacuum pressure. This equipment has a Universal corrosion resistance and some kind of exotic metals. This equipment is known for the quality of its economical gas balance with the environment. The above units are available in 10 Ltr. / 20 Ltr. / 50 Ltr. / 100 Ltr. / 200 Ltr. Capacity with Spherical Reactor and up to 500 Ltr. capacity with Cylindrical Reactor. We are the manufacturer , supplier and expoter of GLASS PROCESS UNITS . 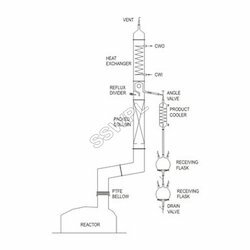 The Reaction Distillation Unit has been designed to suit the customers requirement of combination of versatile reaction/distillation or combination for pilot plant work. This has a flexibility of working at atmospheric pressure as well as under vacuum. Typical unit has a reaction vessel fitted in a Metal Heating/Cooling bath having facility for heating and cooling both by means of Heating/Cooling Fluids as a media. The Standard system is equipped with stirrer having mechanical seal,a packed column on the side neck of the vessel, reflux divider, coil type condenser and or receiver system having a product, cooler, vent, drain and vacuum valves, Options of or speed variator by mechanical variator or electronic variator can be provide. Receiver System is equipped with Product Cooler, Vent / Vacuum Valve and Drain Valve. Available units: 10 Ltr. / 20 Ltr. / 50 Ltr. 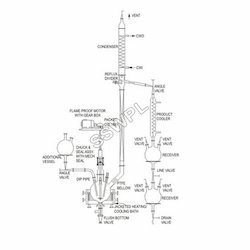 We are offering an excellent quality of Distillation Assembly Over GLR. The type of Typical unit is mounted on a vapour nozzle of glasslined reactor. The assembly has a Glass Packed Column to enhance Distillation. Reflux Divider and Reflux Condenser with twin receiver system is to facilitate working under vacuum or at atmospheric pressure. Receiver System is equipped with Product Cooler. Vent / Vacuum Valve and Drain Valve. Reactors are available in GMP/non-GMP and flameproof/non-flameproof versions along with complete automation as well. Addition of jacket in cylindrical reactors. Addition of System Stirring arrangement. Providing heating and cooling baths and mantles where temperature control is required.